The Philippine delegation, led by DFA Assistant Secretary Noralyn Jubaira-Baja of the United Nations and Other International Organizations (UNIO) shares the Philippine experience in promoting a “Culture of Peace” at the national, regional and multilateral levels during the Ministerial Meeting of the UN Alliance of Civilizations-Group of Fiends (UNAOC) at the 73rd UNGA in New York. 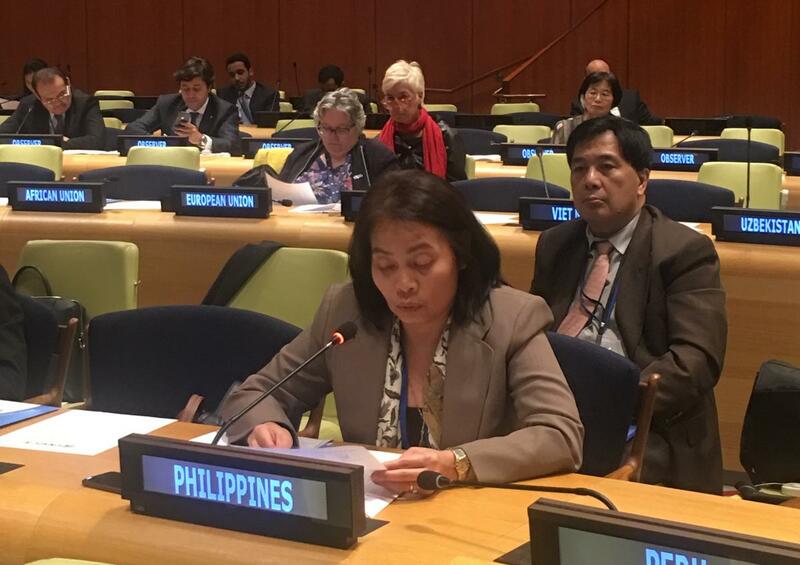 28 September 2018, New York City – The Philippines shared today its experience in promoting a “Culture of Peace” at the national, regional and multilateral levels during the UN Alliance of Civilizations-Group of Friends (UNAOC-GoF) Ministerial Meeting held on the margins of the 73rd UN General Assembly in New York. “At the regional level and in line with the ASEAN Community Vision 2025 which complements the 2030 Agenda for Sustainable Development, ASEAN, under the Philippines’ chairmanship, adopted the Declaration on Culture of Prevention (CoP) for a Peaceful, Inclusive, Resilient, Healthy and Harmonious Society at the 31st ASEAN Summit in November 2017 in Manila,” Assistant Secretary Baja explained. At the multilateral level, Assistant Secretary Baja said that Pakistan and the Philippines have co-sponsored a UN General Assembly resolution under the Culture of Peace agenda since 2004 which aims to (a) promote interreligious and intercultural dialogue to achieve peace and stability and as the most promising course for realizing the 2030 Agenda for Sustainable Development; and (b) strengthen mechanisms and take appropriate action to promote constructive dialogue across cultural and religious divides. Over 30 Member States delivered and submitted their respective national interventions reiterating support for the UNAOC’s culture of peace agenda.